Once upon a time there was a 10 year old girl who loved to play "Bookstore" with her friends. She spent hours and hours alphabetizing her extensive book collection and then painstakingly wrote out by hand a list of all the titles, authors and prices of her books. She'd spend hours at the window in her bedroom playing Drive Thru Bookstore. Because, really, what could be better in the eyes of a rather nerdy child? "I'll take Anne of Green Gables to go, please. Oh, and why not add a side of The Babystitter's Club?" After a while the game grew old, but she still loved to look at the detailed list she'd created. She came to the realization that maybe owning a Drive-Thru Bookstore wasn't for her, but list-making definitely was. Even years later, it was really difficult to get rid of that list. I've always loved to have things in order and just the act of writing out a list calms my mind. Filing papers is not my cup of tea, though. As our kids have grown it seems like we have been bombarded by paper. And we homeschool and don't use worksheets or have school-related paperwork! I can't imagine what the pile of papers must be like in homes where there's also schoolwork and related announcements, etc. coming home. As I've gotten older and had more responsibilities and more paper coming into the house I've spent a lot of time researching The Best Methods of organization. One that I fell in love with was the Tickler File. There are so many options for making it cute! And look at all those numbered files all lined up. Makes my nerdy-heart beat a little faster. But after trying this method for a while, I felt like things were falling between the cracks. I would go several days without having anything in my Tickler File and then would get out of the habit of checking. Then I'd suddenly remember and have to rifle through several days' worth of files in a panic for the one paper I knew I needed. In my homemaking experience (14 years now! ), I've discovered that the simplest method is often the best. I've got a lot on my plate and if something is not simple, it's probably not going to happen regularly. Grand plans and gorgeous organization looks impressive, but I need something that will work in the busy day-to-day of homeschooling, shuttling kids to lessons, trying to get a small business off the ground, service in church and other volunteer opportunities and trying to create something every single day. I've tried many methods, but finally settled on the simplest thing I could come up with. 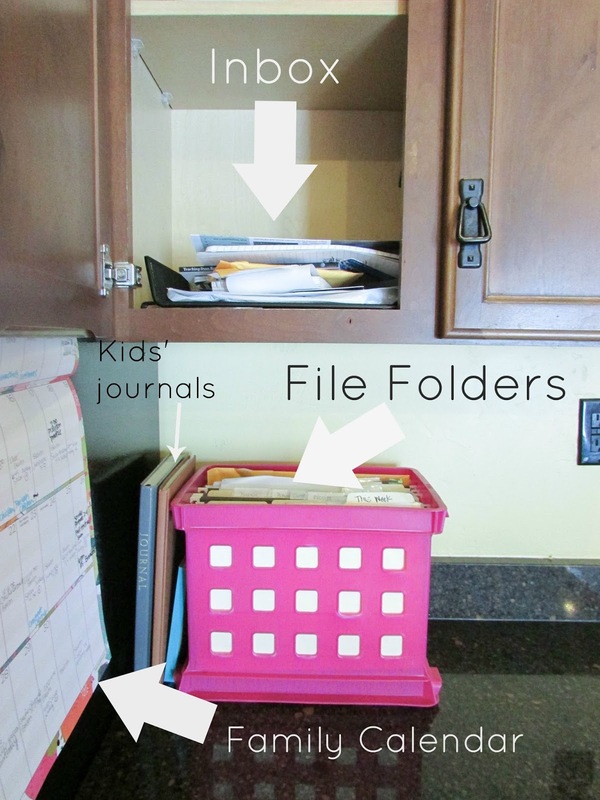 I use a file box like this, hanging file folders and Manila folders with the following labels. First of all, we use automatic bill pay and paperless billing as much as possible. Anything I can pay online, I do. 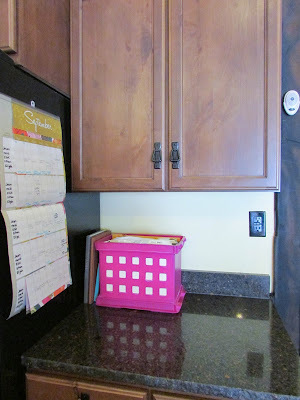 This cuts down on paper clutter and on my need to be actively paying bills. We still check in every month to add the bill amounts to our budget (we use Mvelopes) and to make sure the charges are correct. I get rid of stuff before it comes into our house. When I get the mail, I quickly flip through to see what it contains and often junk mail doesn't even make it into the house. I'll stop by our recycle bin on the way back into the house and toss unwanted items in right that minute. If someone else brings in the mail, they usually set it on the kitchen table, and I go through it as soon as possible and recycle what we don't need. 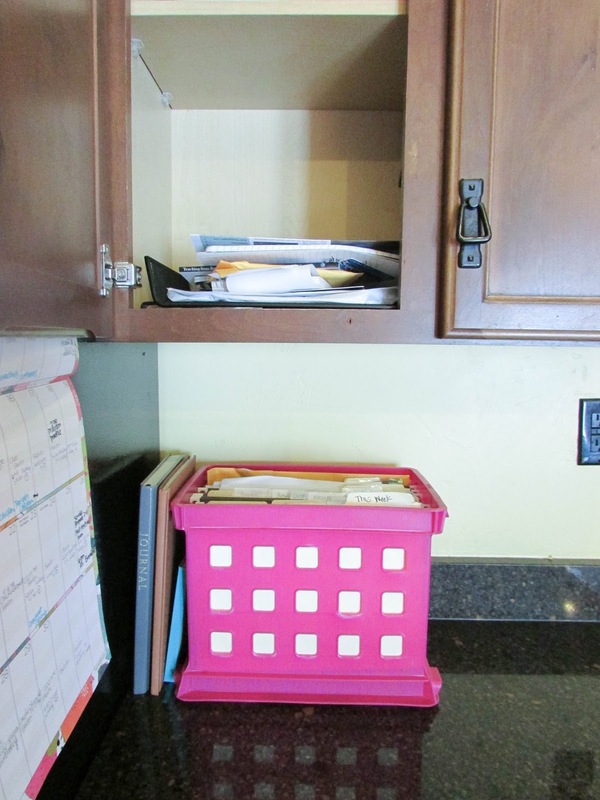 I keep an inbox in a cupboard in our kitchen. All papers that need to have something done to/with them go here. Notes from kids that I may or may not want to keep, bills that come in the mail, grocery ads, birthday party invitations, scraps of paper with phone numbers or ideas, etc. If a child (or my husband) hands me an important paper and I'm standing in the kitchen, I add it to the inbox. If a child (or my husband) tries to hand me an important paper and I'm somewhere other than the kitchen, I ask them to put it in my inbox. In this folder are all of the bills, paperwork, reminders, forms, etc. that I need to do this week. It might have checks to deposit at the bank, a doctor's bill to pay, a receipt to submit for reimbursement, and a children's choir schedule to add to my calendar. I can easily grab it as I'm heading out the door and have everything I need to run several errands at once. This folder contains items that are important for future use, but not this week. It might contain an invitation to a baby shower, tickets to a play, or paperwork I am waiting on for whatever reason. If I need the paper but I don't need to actively do something with it this week, it goes here. These folders are meant to contain keepsakes or other papers we may want to hang onto for scrapbooks. This is long-term storage. Once every few months, I'll go through each person's folder and toss stuff that no longer seems important. I'll paste papers into their journals or scrapbooks or add them to our binders of homeschool assignments we want to keep. This allows me to be selective about what we keep, by giving me a little distance from the event. With that perspective I can see whether, for example, the drawing Ethan did is so absolutely precious that it belongs in his journal or whether it's not as important as I thought when I first placed it in his folder. This may seem harsh, but when your kids produce as many drawings as mine do, it's absolutely impossible to keep everything. Drawings could easily take over our entire house, so I'm all about selecting the best of the best to keep and being able to store them and treasure them long term. This is where I keep stamps, envelopes, checks, address labels and anything else I might need for paying bills or sending letters. I don't coupon much anymore, though I used to. But we still use coupons frequently for going out to eat and for my many trips to arts and crafts stores. ;) Coupons that come in the mail go into this folder, including those magazines with local businesses in them. When we decide to go out to eat, I'll look quickly through this folder to see if there is a coupon we want to use. No clipping unless we actually use it, and I go through every couple of months or so and recycle the expired coupons. If we receive a gift card, it goes in this folder. Once per week, I have a sit-down planning meeting with myself. I go through my inbox and look at each and every paper and process it. If it's something that needs to go on the calendar, I add all details to my google calendar and add just the basics to our family calendar. Then I RECYCLE THE PAPER. I do not hold onto it. I'll add papers I want to keep long term to the appropriate person's folder, add things I need to take care of this week to the THIS WEEK folder and things that will need action in the future, but not this week to the HOLD folder. This simple method has been revolutionary for me. I no longer feel worried that I'm going to miss something or like paper is piling up all around me. 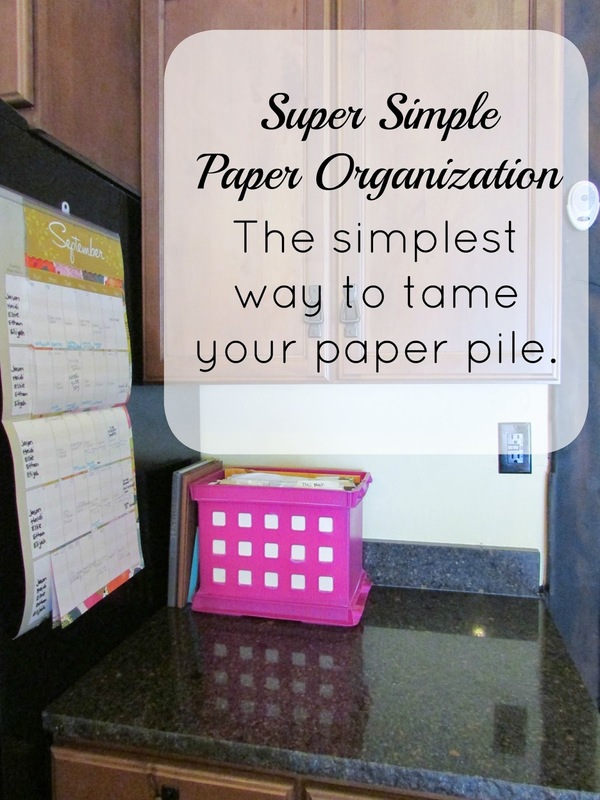 Is your paper under control?